The check protector in reality! You might remember the Search Challenge about the check protector from a couple of weeks ago. We tried to figure out what this strange device was... and we succeeded. Much to my delight, Jill (who owns the previously baffling object) attended my class on "Google Books and Scholar" that I gave last evening in Mountain View. AND she brought along the check protector itself. What a delight to see the thing itself in reality! ... for a few old photographs. In his message to me asking this question, he pointed out that he's been around for some time, and surely there are some old images of me out there on the internet someplace. In his case, he's certainly right. The problem is how to find them. 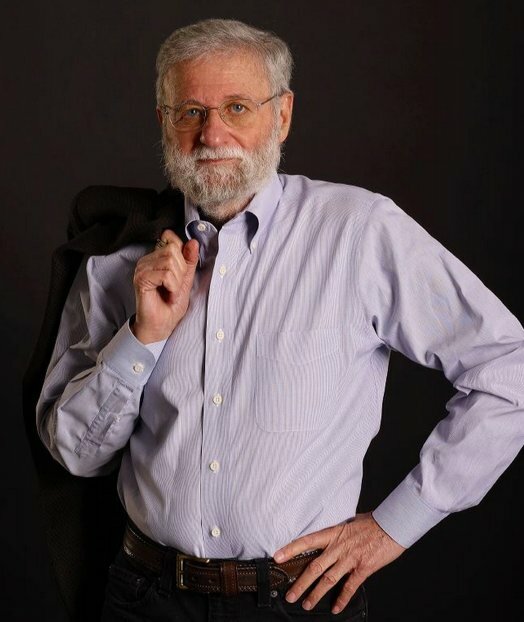 You might have read one of his books (The Design of Everyday Things, Things That Make Us Smart, Turn Signals are the Facial Expressions of Automobiles, or The Design of Future Things), or seen his TED talk on "Three ways good design makes you happy." 1. Can you find photos of Don Norman that were taken BEFORE 1997? The ideal answer will give a link to a photo, along with a year, and a description of what you did to find it. And it's no fair finding his personal web site's collection of images. He presumably knows about that. Obviously, the real challenge here is to get verified dates with the photos, or some photo evidence that pins the date to a particular year. Even though Don is incredibly well-known, I found it a bit tricky to solve this problem. Can you figure out what I did to find ~100 photos dating back to the 1980s? Remember to tell us HOW you found the images. We all want to learn what method you used to come up with your findings. On Friday I'll come back and tell you what I did to find his pix. to answer this week's Challenge. A higher-res version of this image. 1. There are a lot of buttons here... I want to be sure I don't push the wrong button! Can you figure out which button changes the temperature of the seat? Yes, that's an option here. A friend told me so--but... which one changes the temperature? 2. Extra credit: What do the other buttons do? Answer method 1: Let's do the obvious thing... Can we look up the characters that seem like they might be involved? (Think about it-- if we're trying to change the temp, there's probably an HOT and COLD (or warm/cool) pair. 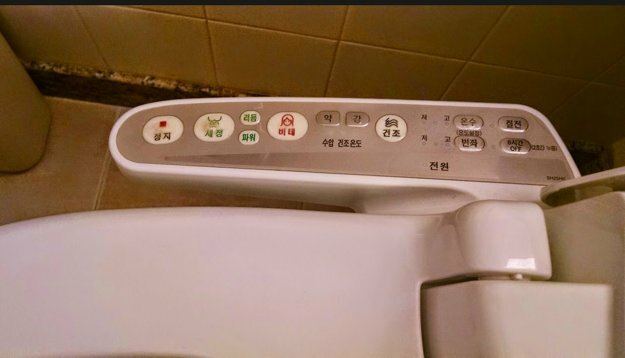 It seems pretty clear that the buttons on the left are Stop and Bidet, but the others I couldn't figure out. 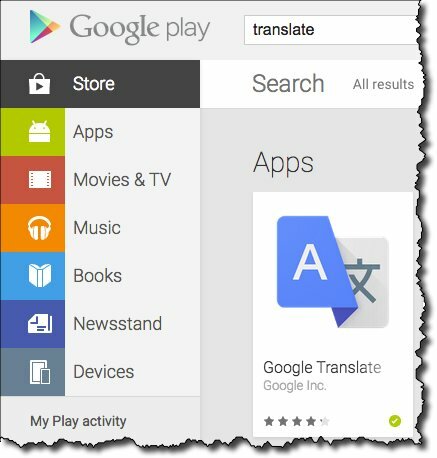 Could we use Google's Translate app to help out here? 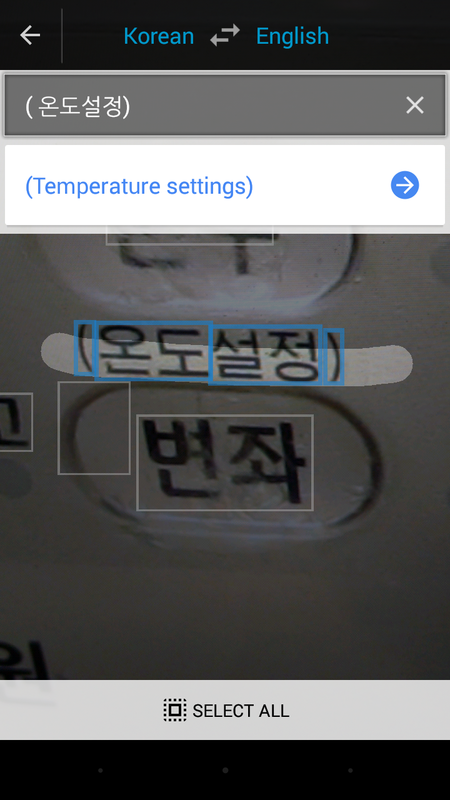 This App is available in the Play Store, and it's pretty much a point-shoot-scan-translate mobile app. When I run my finger over the text in the middle and hit "translate," I find that it shows up as (Temperature settings) in translation. The good news here is that we found the temperature settings: it's the buttons that are second from the right. The bad news is that using the Translate app doesn't work very well on the other texts. I really DID get lucky here--some of the other buttons are either too worn out to be read accurately, or are a kind of abbreviation (like "H" and "C" on English water taps). But note that sometimes the translations vary. 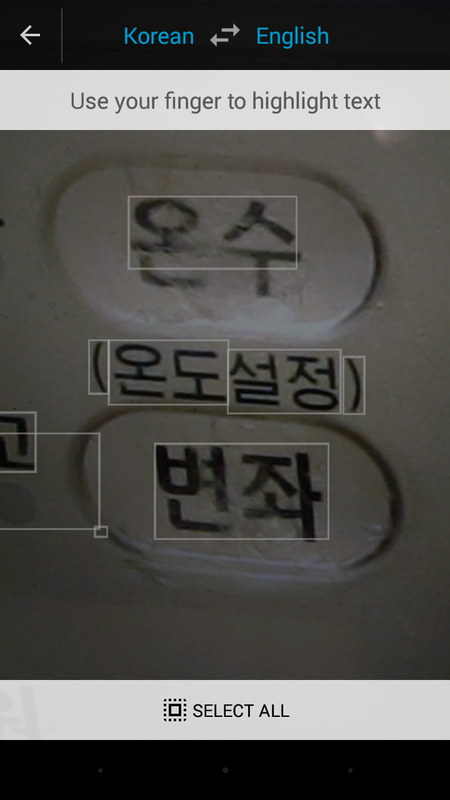 In the above example, I wrote 변 좌 (or what I THOUGHT was that), and it was translated as "Left side." But using the Translate app, I find that it could also mean "
Or, I wrote 저 and got the translation "That." 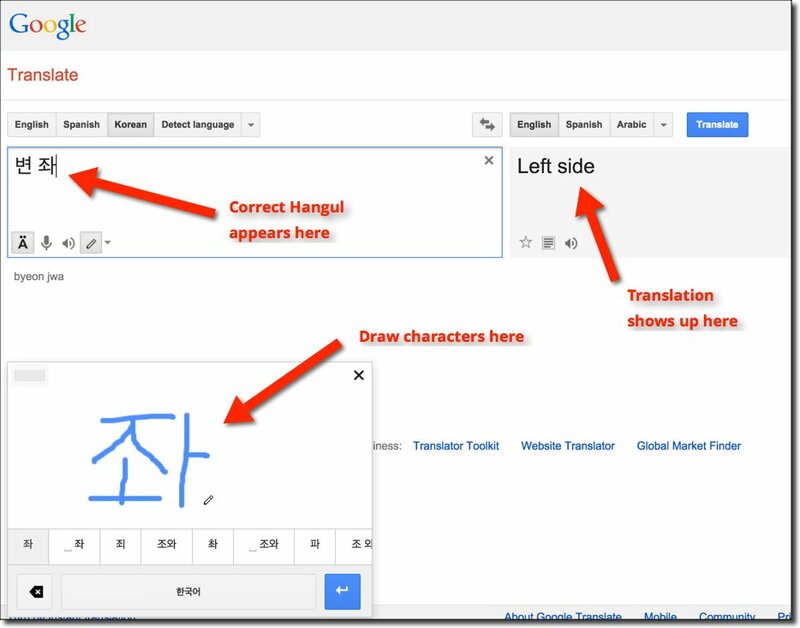 So, by going back and forth between using the Android-based Translation app and the writing-the-Hangul characters method, I was able to get most of the text. but mostly I found were out-of-date pages. 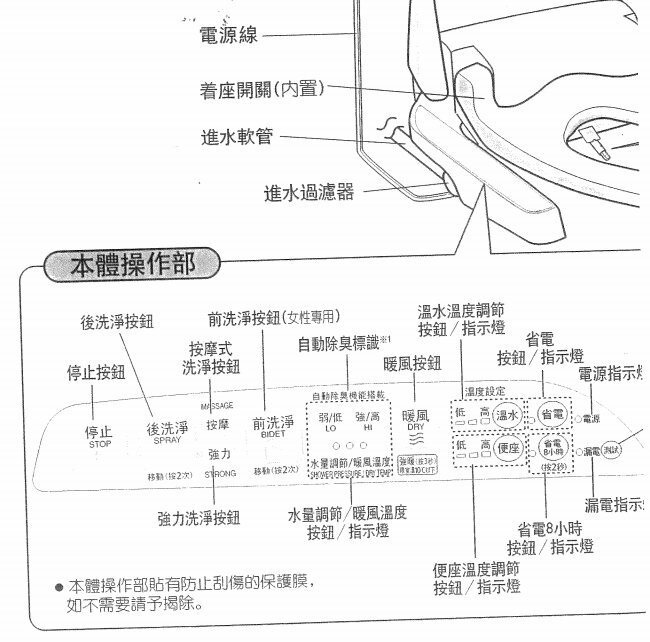 I DID find a page for the Panasonic DL-SJX30HWM, which is (apparently) the same toilet seat in Japanese. The resolution isn't the best, but it does confirm the text I'd figured out via the Translation app. Only then it occurred to me: I bet I'm not the only English-only speaking person with this issue. 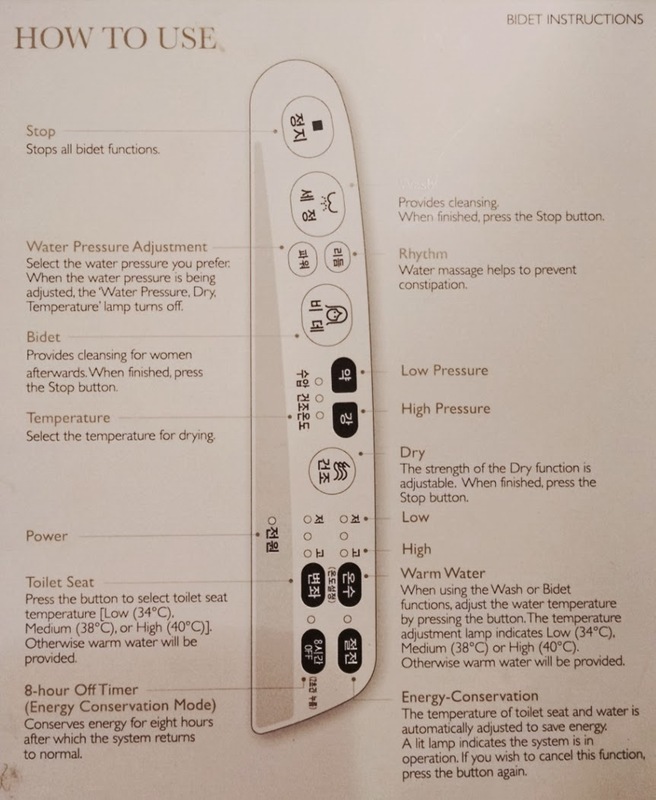 So... the answer to this Challenge is that the two buttons second from the right control the water temperature and the toilet seat temperature. Given the amount of wear on the surface of the buttons, it looks like you press them repeatedly until you get the right temp (that's indicated by the little lights to the left of the button). We did a pretty good job, all things considered! 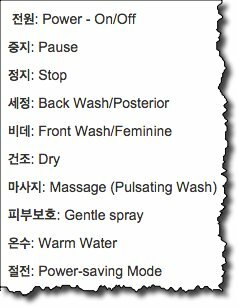 Note that I double-checked everything, although I did ignore some of the translations that my handwritten Hangul gave me--I didn't trust my handwriting skills! Sorry... 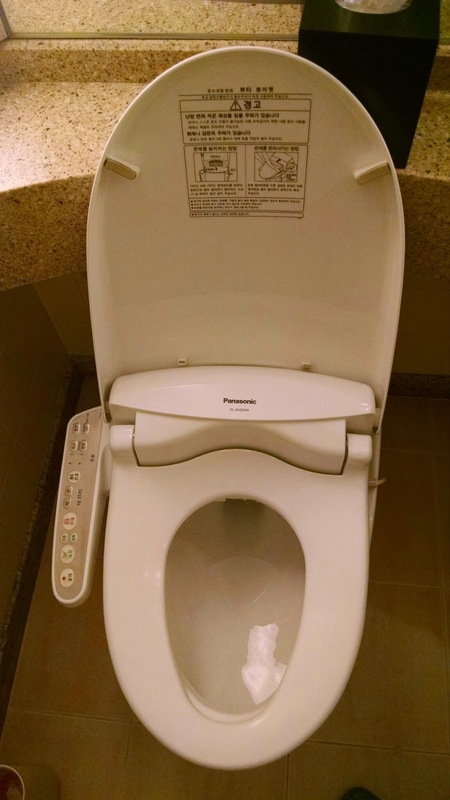 I put the wrong (i.e., low-res) version of the Toilet User Interface into yesterday's blog post. Here's a better image for you to examine. Clicking on the image below will give you the full-resolution image. I sometimes find remarkable things. Sometimes these remarkable things require a bit of research to understand. Here's a link to a higher-res version of this image. So there I am, trying to use this rather... personal... interface. Be sure to tell us HOW you figured this one out. Inquiring minds want to know! Remember that our challenge was to figure out who and why for these pix. 1. Figure out who/what these photographs depict. In particular, are they depicting real people, or just characters from the legendary past? In either case, who are these people? (1) Who is the sculpture is depicting? (2) Where the sculpture + building is located? (3) If you can, what's the story here? This is a lot of work--what's being commemorated? For Supreme Extra Credit, can you figure out who were the models for (a) the young girl in the center of the second picture, and (b) the rather ferocious looking fellow in the first? 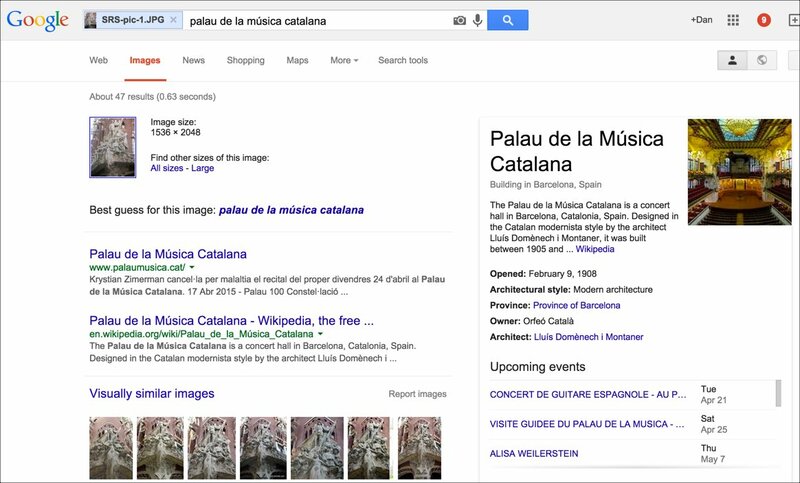 Answer: Google Image search will take care of these two problems. Tells us a lot about the building itself. 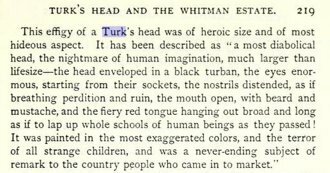 The Wikipedia article tells us that the 16-story building, constructed of white brick with granite and limestone trimmings, is featured by a massive Turk's head in the center of the curved façade, reminiscent of the wooden effigy of an Ottoman warrior that formerly adorned Whitman's corner. While the newspaper has a couple of articles on the building, I found that Brown.edu (the local university) has an article about the building, written up by an architecture group there. This confirms the basic story, and provides a LOT of detail about the design and mechanical structure of the building. leads to a couple of books. 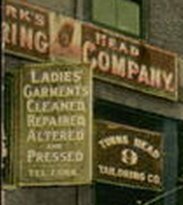 Providence (by MacGown, 2006) has a pair of lovely images of the Turk's Head building, one from the "original" building (around 1850) and one from 1913 of the "new" building (which looks much like the photo above). Part of page 17 from Providence. It's a nice picture, but I wondered if I could find another version of it. So I screenshot this image and did another search-by-image. I was able to find a lovely, hi-res version of this image that's from a scanned postcard. (Photo postcards were quite the thing in the early 20th century.) Here's a small section of that photo from the left side of the card, zoomed in and cleaned-up a bit. 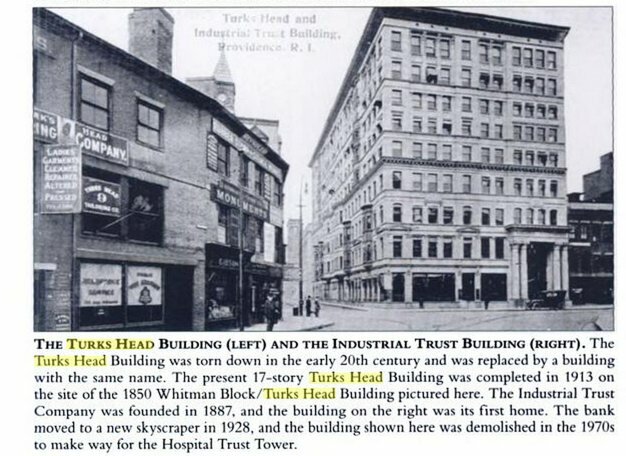 It's pretty convincing that this was an early Turk's Head building. 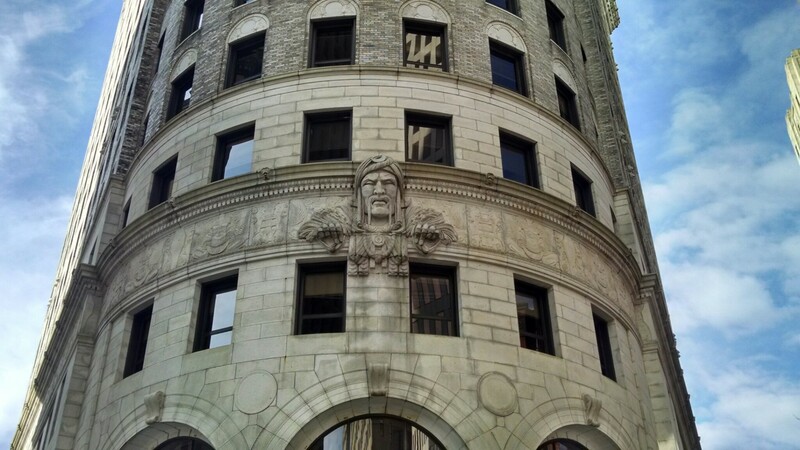 When the "new" building was constructed in 1913, the architect naturally included a version of the head on the ship-like prow of the new building. I'm obviously not the first person to take this picture. tells us (from multiple sources) that the building's architect was Lluís Domènech i Montaner. The large sculpture on the corner is by Miquel Blay, and is entitled La cançó popular catalana (1909). Catalan song is personified as a graceful maid before a group of male and female figures. Above them is a copy of a silver statuette of St. George in the Palau de la Generalitat de Catalunya chapel. Now, can we figure out who the model was? I even checked out images of all of the Blay's sculptures, hoping to find a common thread among the young women in his statues, but that failed as well--he seems to have either used multiple models, or he has an extraordinary inventive capacity. 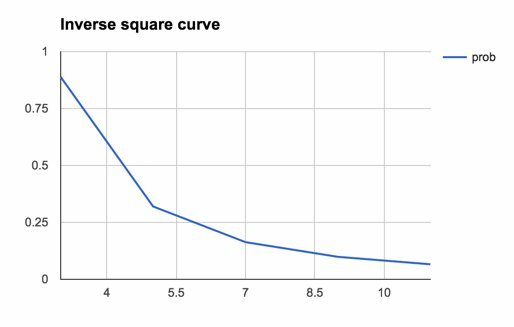 Search lessons: The foremost lesson is obvious--sometimes searches fail. I wasn't able to figure out the model for the Palau sculpture, even though I spent a couple of (happy!) hours searching for it. I'm reluctant to invest much more time because there's no evidence that he had a consistent female model for his works, or that he had a particular person in mind (as opposed to the generic "personification of music" that we found). For the Turk's Head building, the lesson here was that sometimes digging deeply into the Books actually pays off handsomely. I wasn't able to find the Historical Society texts using just regular web search--the books content is buried a bit too deeply for that. Plus, looking up the text on the Internet Archive was a stroke of genius. Lots of stuff is out there, if only you keep looking, and bear in mind that sometimes you have to go to the door and open it up to see what's inside. The last Challenge took me a while to figure out. Getting the answer wasn't that difficult, but figuring out how to do it without paying an arm and a leg... that was harder. Here's the situation: If you're trying to research on a topic (say, cognitive psychology, or art history, or whatever), you can use Google to search over the "open web," that is, all the stuff that the Google spider has been able to crawl. When you search on Google, you're really searching our index of content that the spiders have crawled. But some content can be crawled, but not displayed. That is, in some cases, our spider can index the text of the document so you can find it, but when you click on the link, you might not be able to actually see the original source material. The thing is, lots of publishers don't provide open access to all of their content. 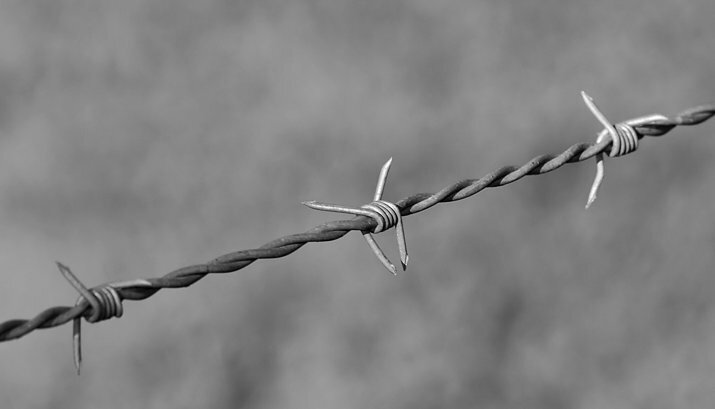 The let the spiders crawl the content (to make it searchable), but then put the content behind a paywall. That makes sense if you're trying to make money, you want searchers to pay for the ability to search and read. But it's kind of a pain if you're just trying to do research. Sometimes you'll find a document--say, a book like Schirmer Encyclopedia of Film. This is a big (1200 pages) reference work that you might use to do some research on directors, films, genres, production methods, etc. But it's also $528 new, and even used copies typically sell for around $400. This is a classic reference book, the kind you might find in library reference collections. Of course, getting access to it online would be incredibly handy--the kinds of search you can do in an online version of a book is very different than with a hardcopy version. But the only way to get online access is through Gale's system--they have rights to the e-version of the book, and you have to use their system (which costs money) to access it. you'd find this quotation in the Google Books copy of Shirmer Encyclopedia of Film: Academy Awards - Crime Films. This is paper by Dwyer that looked interesting, but the first link goes to the public version of ERIC, and they don't have the full-text (at least not via the public web interface). It's worth knowing about these paid databases, because they sometimes have the only online-available copy of an article. I know it's sometimes hard to pay $35 for a paper from the publisher when you don't even know if it's what you're really looking for--so this is a way to see the entire paper without having to break the bank. Of course, if you find the paper to be what you want, and you end up using it in your research, the right thing to do is to go purchase a legal copy of the paper from the original publisher. 1. Some online content can be found in slightly different forms than what you might expect. That's the lesson of the Schirmer's guide. If you only looked for the complete book, you might miss all of the different volumes as they exist in Google Books. 3. Be sure to notice that some content collections (e.g., EBSCO) direct you local libraries that have access rights. This is a wonderful service--use it when you can. 4. Sometimes you can do a workaround by searching for a PDF of the article. With luck, you'll find a version of it somewhere on the web. And, as I said, IF you use this article (or even read it end-to-end), you really should go buy the real PDF from the provider. 5. There are a lot of paid databases out there: Learn which ones have what kind of content. Obviously, this is a huge problem; in the future I'll write about the ones I use, and how I learned what's where. 6. Be a part of the university / college / library ecosystem. Having a couple of library cards (especially for libraries that have access to the paid databases) is incredibly valuable. Besides, the librarians frequently know things that can shave hours off your research time. One of their great strengths is knowing what all of the paid databases are and what they contain. Search Challenge (4/15/15): Who are these mythic characters? no surprise there. But perhaps a bit unlike most travelers, I like to figure out the backstory to the remarkable things I shoot. As always, be sure to tell us what worked for you. We all want to learn what you did to discover the answer to these Challenges. Teach us! P.S. I'll be traveling to a distant shore on Friday and Saturday of this week, so the answer will be posted by Monday of next week. I told you this... would be difficult! 1. 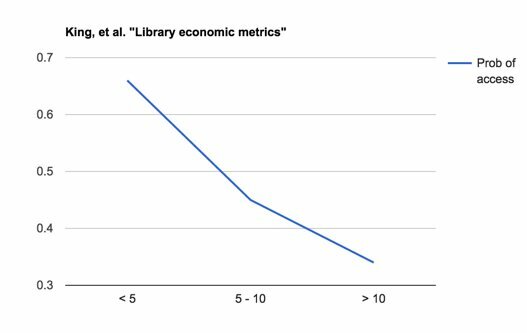 Can you find the reference for.... A paper I once read that claimed "the probability of a reader reading a book in the library was a function of the distance of that book from the library catalog." 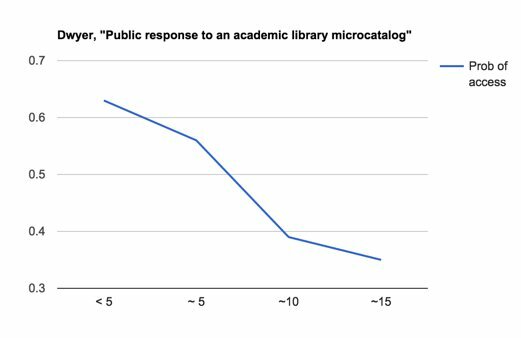 As you can tell, this research was done a while ago (back when library science papers were measuring book access in terms of card catalog distances). I haven't had any luck finding the original paper that made this claim. Can you? What's the citation? Dwyer, J. R. (1979). 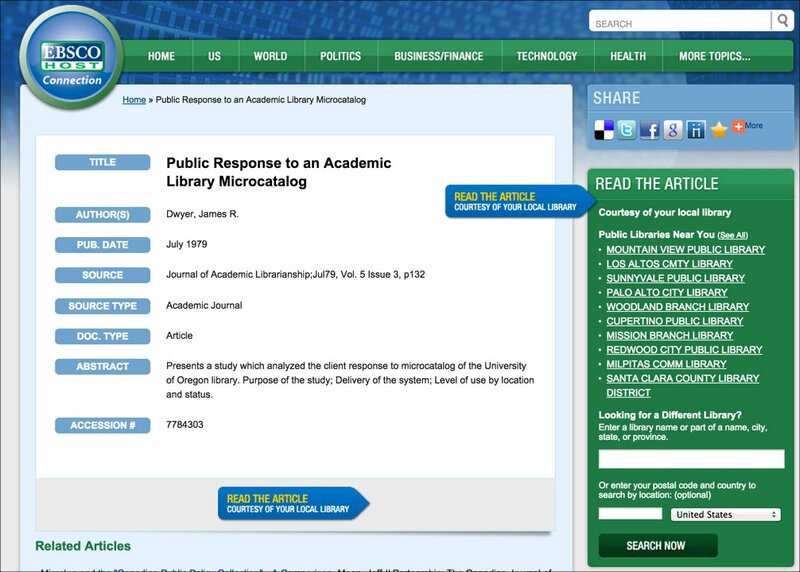 Public response to an academic library microcatalog. Journal of Academic Librarianship, 5(3). The URL is http://eric.ed.gov/?id=EJ206855 -- and if you notice the last word of the green text, you'll see the word "ERIC." It's a large collection of articles from the academic (and especially academic education) world. You can see the entire list of articles indexed by ERIC by looking at their catalog of journals list. Unfortunately, not all of the articles indexed by ERIC are available in full-text. That means we have to go to another place to find the full-text! tells us that the "full text is available from EBSCO's Academic Search." This tells us that the journal is available in full-text on EBSCO Host (a paid database service). This is a great approach IF you know that such a database exists and if you have access to it. Unfortunately, like many databases, EBSCO Host requires payment to access. HOWEVER, I was able to get access to EBSCO Host through my Mountain View library account, which is one VERY good reason why you want to have a library card--you can still get access to articles that aren't available in any other way. Here are 4 other reasons... (Notice that it was the 3rd library I checked--my other local libraries didn't have it!) I just logged in with my library card and clicked on the "Research" button. In that list I found the EBSCO Host database, clicked on it. 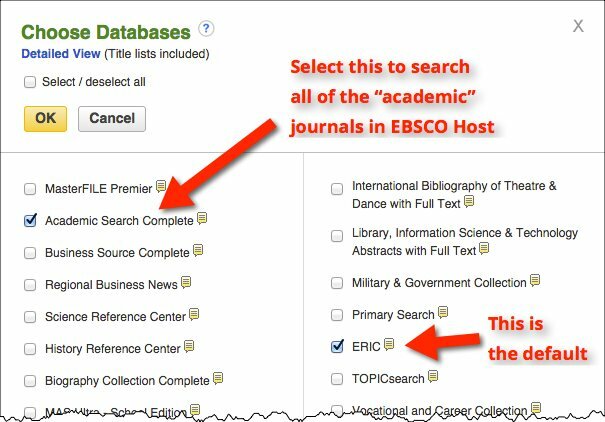 That took me to the EBSCO Host data base, but I noticed that it defaults to "Searching ERIC." That's a fine database, but is aimed primarily at educational resources, not the the "Academic Search" that provides access to this journal. And now you have access to the full-text! There's more to write about this, but it's getting late and I want to send this out to you before tomorrow's new Challenge. Excellent job on everyone's part in getting this all figured out. Bottom line: These two articles give a pretty decent case that the probability of access DOES diminish with the distance (or more accurately, the amount of time it takes to get to the book). However, in order to find this we had to do some fairly clever searching--first to choose the right / workable search terms, and then to get to the second article we had to go to a paid database via our local library. 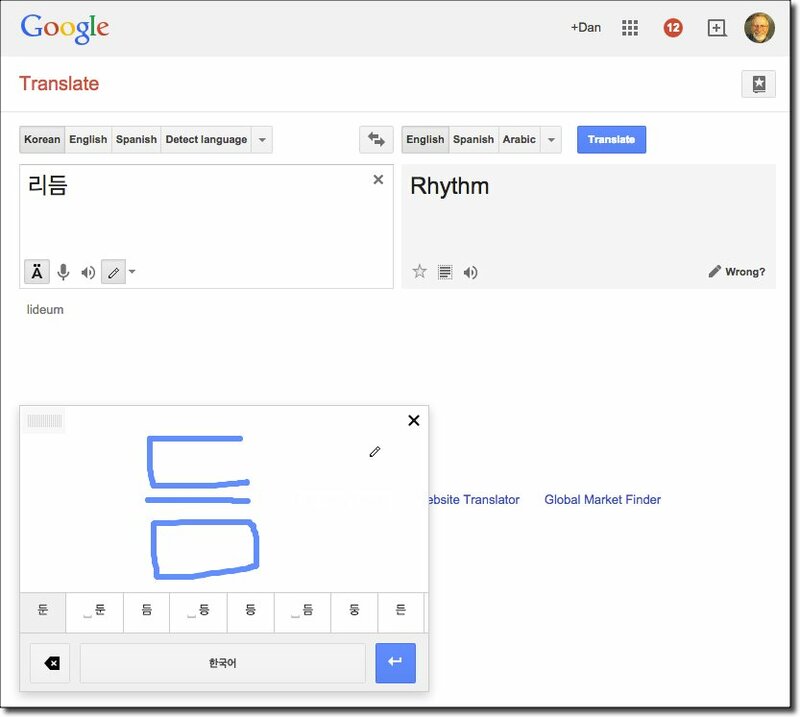 It's because Google search works on word sequences as well as simple words in the search. That is, the phrases "book in the library", "library probability", and "library catalog" are all part of the text, and therefore match. The only way to get this to work is to keep trying with short phrases that you think are likely to be in the text of the perfect article. Think about it this way--if you were to write an article about this topic, what kinds of likely short phrases would be in that text? There might be a shorter query that will find this article, but this query isn't bad at all. And WRT having to also search EBSCO Host for the full-text of the paper: Sorry, that's the way it is these days. Some journals are indexed and text-available via databases like EBSCO, Gale, or Proquest. Luckily, all of these providers allow Google to index the text, but not provide the full-text. For that, you still have to figure out which database has the full-text, and then figure out a way to get into that system. Even more luckily, many libraries still provide this kind of access to their patrons. Thank heavens! Hurrah for libraries again! 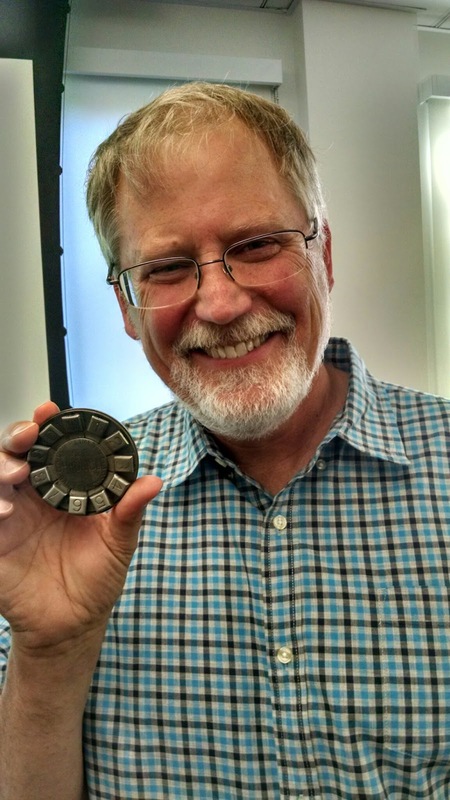 Search Challenge (5/1/15): What's this?